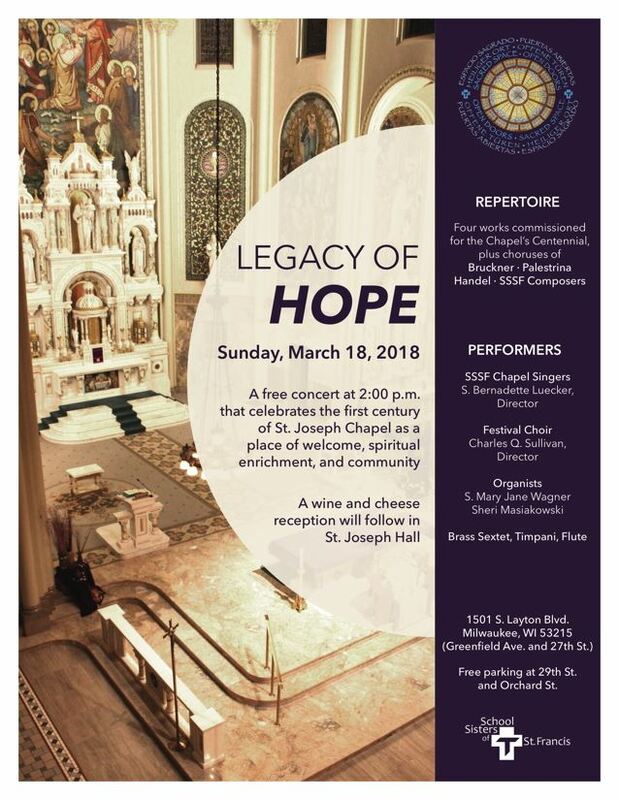 The yearlong celebration of the 100th anniversary of St. Joseph Chapel, one of Milwaukee’s most splendid spiritual and architectural landmarks, will conclude with a free concert on Sunday, March 18, at 2:00 pm. Located in St. Joseph Center at the corner of Greenfield Avenue and South Layton Boulevard (South 27th Street), the Chapel is part of a large complex that includes the international motherhouse (headquarters) of the School Sisters of St. Francis. The concert, titled “Legacy of Hope,” will celebrate the Chapel’s first century as a place of welcome, spiritual enrichment, and community. The concert will be followed by a reception in St. Joseph Hall, in which archived photos of the construction of the Chapel are on display. Free parking is available in the St. Joseph Center lot at 29th Street and Orchard Street, with street parking also available. The center is also served by buses on Route 27 (27th Street) and Route 56 (Greenfield Avenue).